The Snatcher sequel that we've all been waiting for is coming, but it's not a game. In Hideo Kojima's never-ending quest to sow confusion by creating really strange words (remember transfarring? ), he's teaming up with Suda 51 to develop a sequel to Sega CD, PlayStation, Saturn, et al. cult classic Snatcher called Sdatcher. The only problem is that it's not a game. Instead, Sdatcher is an original radio drama. It's based on Snatcher, but has a "d" where the "n" should go for some reason (*edit* it's apparently a play on Suda 51's name). 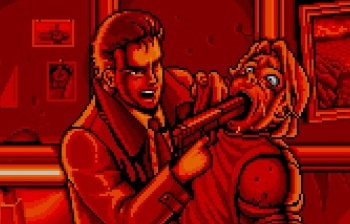 Snatcher was originally designed by Hideo Kojima and released in 1988, but made it to various systems in the following years. It didn't necessarily sell well, and has become a rare and treasured game. Snatcher takes place in a world inspired by Blade Runner, with robotic life-forms killing and taking the place of actual humans. Kojima is planning and directing Sdatcher, while Suda 51 is writing the script. Grasshopper Manufacture's Akira Yamaoka, of Silent Hill fame, is composing the music. If you're let down by the idea that Sdatcher is a radio drama, just hold a controller in your hand and close your eyes while listening (assuming you know Japanese). It'll feel just like a game, I promise. Sdatcher will be released on Kojima's 300th Hideradio podcast.